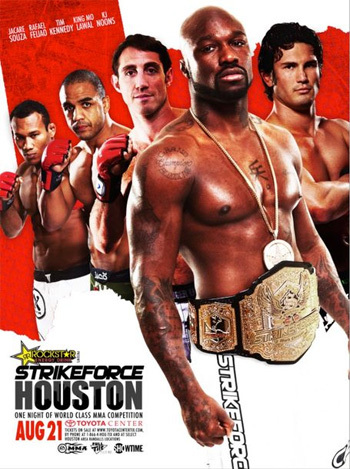 With just 5 days until the curtain is drawn on “Strikeforce: Houston,” the San Jose, California based promotion has released the finalized roster for this Saturday’s event inside the Toyota Center in Texas. The card will feature two championship bouts. Ronaldo “Jacare” Souza will battle Tim Kennedy for the vacant middleweight crown, courtesy of Jake Shields’ exit stage-left. Muhammad “King Mo” Lawal will make his first Strikeforce light heavyweight title defense against Rafael “Feijao” Cavalcante in the card’s featured attraction. Jacare owns an impressive 12-2 mixed martial arts record and is currently enjoying a two-fight winning streak. The grappling ace has ended 10 of his victories via submission, so it’s clear where this BJJ black belt would prefer for the scrap to go. Kennedy, a United States Army Special Forces sniper, has rattled off four consecutive victories. The 30-year-old submitted Trevor Prangley in the 1stRound with a vicious rear-naked choke at “Strikeforce: Los Angeles” this past June at the Nokia Theatre in Downtown L.A.
King Mo is an NCAA Division II national wrestling champion who captured countless amateur titles before entering MMA. He was last seen showcasing his superior ground game against former champion Gegard Mousasi at “Strikeforce: Nashville” en route to jacking the 205-pound belt.